Felipe de Jesús Calderón Hinojosa (born August 18, 1962) is a Mexican politician. He was President of Mexico from 1 December 2006 to 30 November 2012. He is a member of the Partido Acción Nacional (PAN), one of the three major Mexican political parties. Calderón was born on August 18, 1962 in Morelia, Mexico. He studied at Free School of Law, at Autonomous Technological Institute of Mexico, and at Harvard University. Calderón has been married to Margarita Zavala since 1993. She ran for president in the 2018 election, but dropped out of the race. Calderón is Chairperson of Global Commission for the Economy and Climate which issued The New Climate Economy Report. ↑ "Felipe Calderón". Encyclopædia Britannica. Encyclopædia Britannica. Retrieved 2008-06-09. ↑ "The Global Commission". NewClimateEconomy.net. ↑ "Members of the Global Commission". NewClimateEconomy.net. 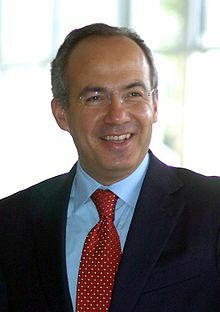 Wikimedia Commons has media related to Felipe Calderón. This page was last changed on 22 April 2019, at 15:50.